Beer Oh! Sorin Genmai Beer is a 6% speciality beer / pilsner from Kuju Kogen, based in in Oita, Japan. It’s part of their all-year round beer and comes in a variety of labels – with this one promoting Beppu, a city in Oita, and their baseball team. Beer Oh! Sorin Genmai Beer is brewed using locally grown genmei, or brown rice, as part of the malt bill. The rice is grown using the same mountain water that is used in making Beer Oh! Sorin Genmai Beer. First a backstory in making sure you read before you buy. Kuju Kogen were doing a special deal on their beers – buy any three and get free shipping. Quite a deal considering the beers are coming from the opposite end of the country. I duly ordered and confirmed. A few days later, the box turned up cold. Perfect! Opened up the box and I had bought three of these! Make sure you read the instructions before ordering kids! And don’t order beer when you’ve been drinking. Beer Oh! Sorin Genmai Beer poured out a crisp golden yellow colour with a plump white head on top. 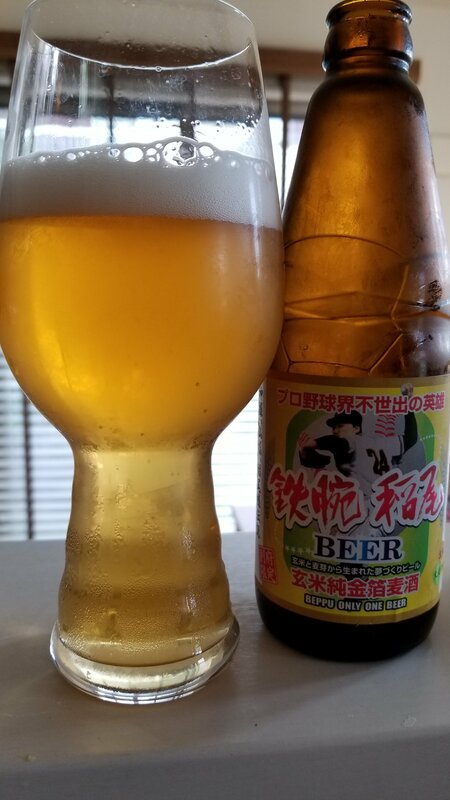 It had a crisp biscuit and noble hop aroma with just an ever so slight rice aroma to it – not enough to bring sake-like qualities to it, but enough so you know it’s there. The body was just like your typical craft beer pilsner – crisp with a hint of sweetness to it and not much else. It was good on a hot day but I wished I hadn’t had bought three bottles of the stuff. There was a residual crackery grainy aftertaste that sprung through the rice but besides that – rather average. Pilsners in the domestic market are a dime a dozen. Ten a penny. There’s enough out there yet this one is really not worth it.